This post would shed light on the following. 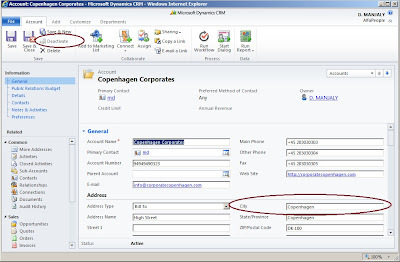 How to override System Ribbon Button in CRM 2011 ( Display / Enable Rule to System Ribbon Button in CRM 2011)? How to show / hide a system button based on a value on the form? 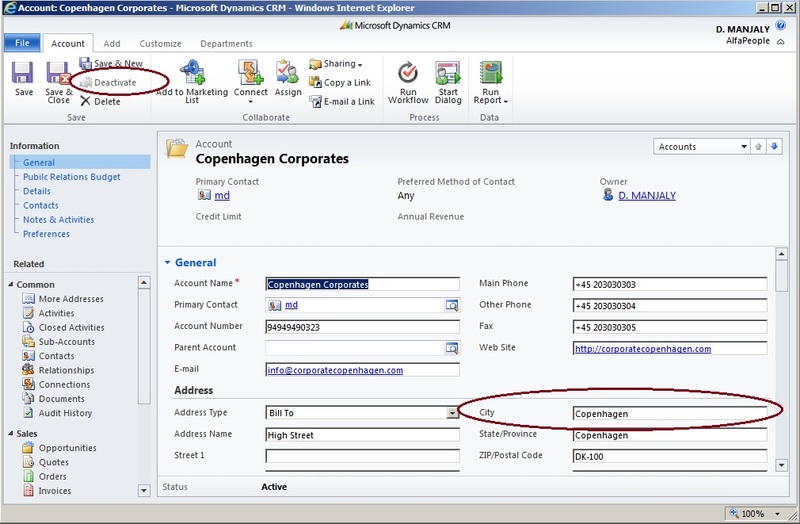 In CRM 2011, it is possible to override the System ribbon button functionality. Also we could apply Enable / Disable Rule Display / Hide Rule to the existing System Ribbon button. In order to grasp this quickly, lets consider a scenario. As we all know, there is a Deactivate system ribbon button on the Account form. 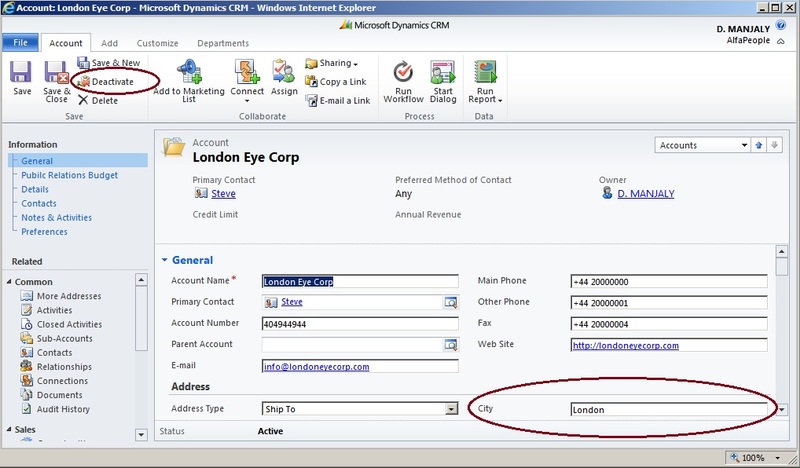 Suppose we would like to Enable / Disable this button based on a value on the Account form. To make it simple, lets consider the City field. There is a key to unlock the door here. what is that key ? Lets see. Lets find out our System Deactivate button. Please Note: We don't need to write the following piece of code. This is just an easy way to refer and then to find the key from SDK. Now can you guess what's the key in this? Its nothing but the Command. The only key thing we need to override the System Ribbon button is to know the command value. Rest is as easy as we open a door with a valid key. We need to write the CommandDefinition as shown below. Please make sure that the code is written under right parent tags. 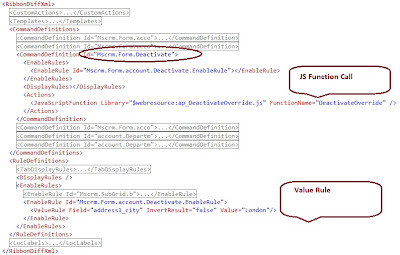 Also the enable rule under rule definitions as show in the above picture. 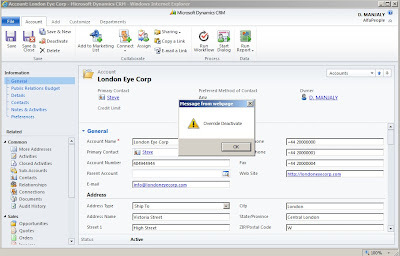 Scenario1: City value is not London -- Deactivate Button got disabled. Scenario2: City value is London -- Deactivate Button got enabled. "тнєяє ѕнαℓℓ вє ѕнσωєяѕ σƒ вℓєѕѕιηg тσ уσυ αℓℓ ιη тнє вℓσωιηg ƒℓσωєя -2012"
Hi, Am running CRM 2013 on Premise. I hope you can help me. 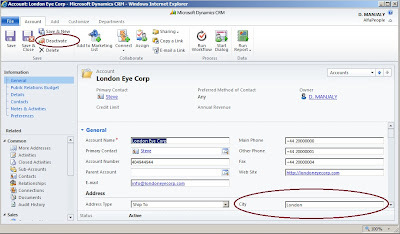 In the lead form I would like to disable the Qualify button on form load and only enable the button when a particular field has been populated. I don't want to make the field required by default as it will stop users saving the record. 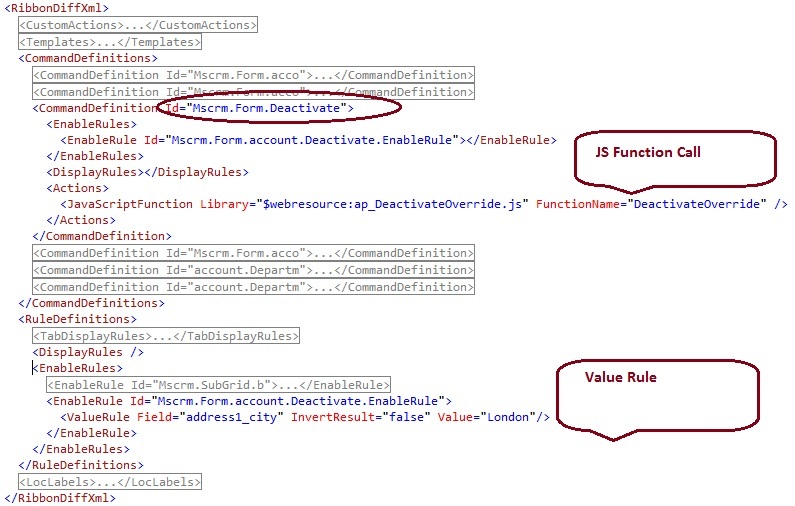 I want them to be able to create and save a lead but disable qualify until they fill particular fields. I would like to do the same in the opportunity by disabling the Close as won button some fields have been populated.